This bright, hand-colored print dated to about 1750 and signed by François-Thomas Mondon depicts a group of figures in a landscape composed of trees, flowers, and a small temple. 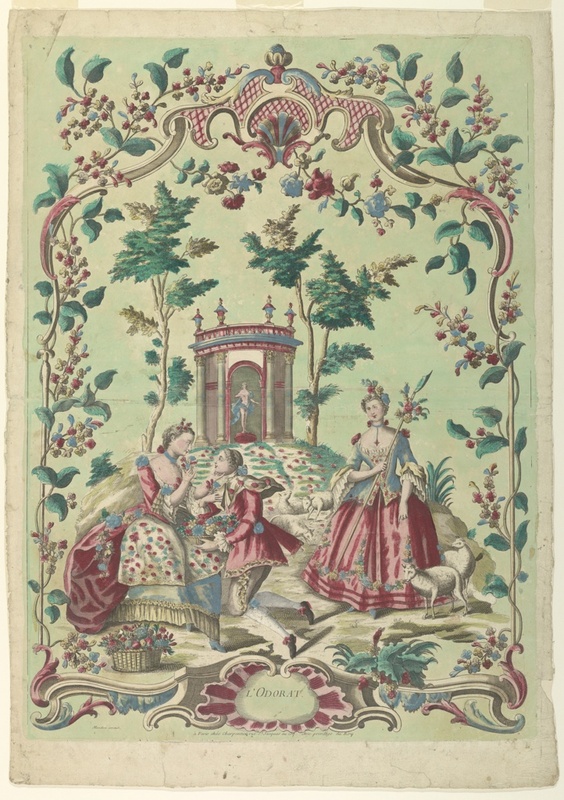 A garland of foliage and flowers curls around the scene’s frame, which forms an arched trellis at the peak and a cartouche bearing the inscription “L’Odorat” (The Sense of Smell) at the bottom. This title provides essential information about how we should interpret the print. At the left, a man kneels before a woman, holding a full basket of flowers in his hand. Receiving his amorous declarations, she gently and lovingly touches the man’s chin and smells a flower. The other woman, at right, is a shepherdess dressed in colorful, French period clothing. Although she does not directly engage with the act of smelling, she complements the theme of the print in her adoption of a pastoral lifestyle, popular as a rustic alternative to city life in Europe at the time. Little is known about the artist who signed his prints with “Mondon invenit” or “Mondon le fils.” François-Thomas Mondon (French, 1709–1755) was active between 1736 and 1740 as a goldsmith, draftsman, and engraver. His best-known prints, published in 1736, were among the first designs to be associated with the word rocaille, and the subsequent Rococo style distinguished by curving forms and naturalistic imagery. Mondon also enjoyed royal support and was was involved with Les Menus Plaisirs, the organization of the French royal household that was responsible for preparations of ceremonies, events, and festivities that took place at Versailles. Mondon’s prints, including L’Odorat, frequently include the inscription, Avec Privilège du Roy, or “With the King’s Permission,” and generally display a wealth of impressive and fantastic architectural structures. L’Odorat is indicative of Mondon’s mastery of the rocaille style and his engagement with contemporaneous glorification of country living. The figures depicted appear free from the corruption of city life, and turn instead to simple, pastoral activities, to the beauty of naive romance and nature. Mondon’s evocation of the sense of smell through floral imagery is an apt one; flowers mean many things depending on their species, but they are often associated with nature, love, purity, peace, and beauty. Mondon cleverly links the sense of smell, above all other senses, to a liberated, pastoral lifestyle, forevermore distant from the complexities of city life under the Ancien Régime.